I hope you had a wonderful Christmas with your family and friends. We had a house full of our children and their spouses and friends and felt very blessed to have them here. One of my favorite things about the holiday is cooking with my children. This year we created a new recipe to add to our Christmas brunch. We had a blast making this and my goodness....it was so incredibly good to eat. The syrup was like drinking butter toffee. I made a large batch this morning to double check the recipe and it was even better the second time around! I think we will eat this for our first breakfast of the new year! Pour eggnog into blender, add eggs, nutmeg and vanilla. Blend until smooth. Pour into a wide open bowl or pie plate. Heat griddle to 350 to 400 degrees. Spray with non stick spray or use butter to keep bread from sticking. Place a slice of bread into the mixture and coat. Place on griddle until light golden brown and then flip and repeat for the other side. When both sides are golden brown take off griddle and butter. I keep mine warm in a 200 degree oven in a glass tray until they are all done. Heat until butter is melted and all ingredients have blended together. Simmer on a med to high heat, stirring often until it bubbles for 10 minutes. Remove from heat and add 1 teaspoon of baking soda. This creates a foamy wonderful texture to the sauce. This is absolutely heavenly! Enjoy!!! I hope you enjoy the upcoming New Year weekend! I am looking forward to a few games, a nap and a couple of movies with my kids before everyone goes home! I cut out two new Valentine patterns and will be posting them this coming week....but for now I'm enjoying the time with my kids. It goes way too quick. Happy New Year! As Christmas day draws near I try to take a few minutes to find peace and remember why we celebrate this time of year. I heard this saying in a song that is my favorite Christmas song called Christmastime by Hillary Weeks. One of the lines of the chorus is "Wise men still follow him each day of their lives." It is a beautiful song with a profound message. I had to stitch this, as I do most things that come to my heart. The pattern is available at http://www.tweetledeedesignco.etsy.com. I hope you are enjoying this week of celebration and are able to find a few minutes to breathe and feel the peace that comes this time of year. Merry Christmas! Ho Ho Ho...Merry Christmas one and all! I hope you have a wonderful week with your family and friends. My house is full of family and everyone is in anticipation of the night that Santa will come down the chimney. That is if he can get down the chimney with the 22 inches of snow that has fallen in the last 24 hours! All this week all Santa patterns are on sale for 25% off! They can be found at the http://www.tweetledeedesignco.etsy.com site and are ready to be shipped. May you have a wonderful week with your family and friends celebrating the most wonderful time of the year! Merry Christmas to all! Day three of snowmen week and this is the third pattern to be listed on sale! Happiness Is Making Friends is my favorite friend stitch....one snowman making a friend. 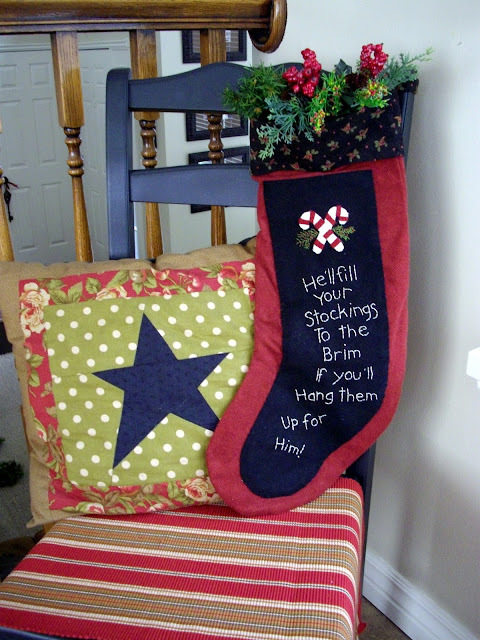 I have stitched so many of these for my friends....it always warms a heart! I am working on an embroidered quilt with nine blocks of these two friends having all sorts of winter mischief. For now this pattern is on sale until December 30th for 25% off the list price. You can find it at http://www,tweetledeedesignco.etsy.com. Orders will be shipped the next day so you will have it in time for Christmas! Starry Night Holy Night is now 25% off through the end of December! You know how much I love snowmen and wool...so this design warmed my heart in more ways than one! I made mine in an evening! I am all about instant gratification!!! I spent last night I took Tina and Adam to the Riverwoods Shopping Center to have them get their "Brother Sister" gifts. Every Thanksgiving night the kids draw names for their siblings to give a gift to on Christmas Eve. They have been doing this for each other since they were babies...and it is their favorite part of Christmas. The key is to keep who you got a secret and find something their sibling would really want. 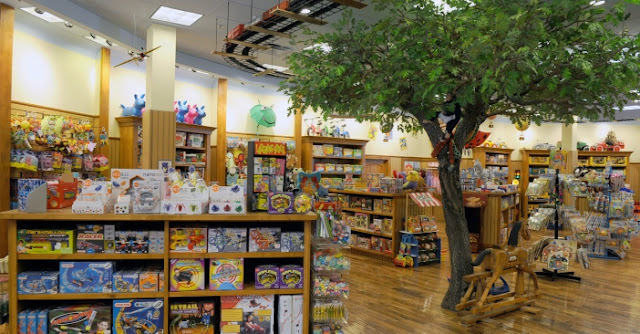 We went to Blickenstaff's and WOW was it busy! It is the funnest toy store next to FAO Shwartz! Mrs. Clause found a bunch of unique and super fun stocking stuffers. There must have been a million kids in there...well not a million but a ton of happy kids. Go check them out and all of the new lights and courtyards they have built at the Riverwoods. Santa's house and the hot scones were fabulous! So come down to Provo and see Utah Counties newest winter wonderland! You can find this pattern and all my other "snowmen" patterns at http://www.tweetledeedesignco.blogspot.com. Orders ship daily so you can get it in time for Christmas. The fun thing about snowmen is they can stay for a few months after the tree is packed away. Combine all ingredients in a slow cooker. Cover and cook on low settings for 2 to 2 1/2 hours, or until chocolate is melted and the mixture is hot. Stir well to combine before serving. Makes 10 servings. You can spice this up with a few sprinkles of fresh grated nutmeg or a peppermint stick. I hope your day went well and you are having a peaceful night. This weekend we had our family Christmas party at our home in Woodland Hills. It was planned months ago as a sledding party. Two weeks ago we had two and a half feet of snow and then it became 6 inches and melting with the 40 degree feet. So we began praying for snow. On Friday it rained all day....snow was melting and I was afraid we would be "ice blocking" instead of sledding! But Friday night a few prayers were answered and we had snow falling at our home and woke up to a two inch dusting on everything. Hurray!!! So, in celebration of the little miracle we had...this week everyday I am going to list one of my "snow" patterns 25% off. To start the week off I have to begin with my simple sweet pattern Little Miracles. You can find the pattern at http://www.tweetledeedesignco.blogspot.com. 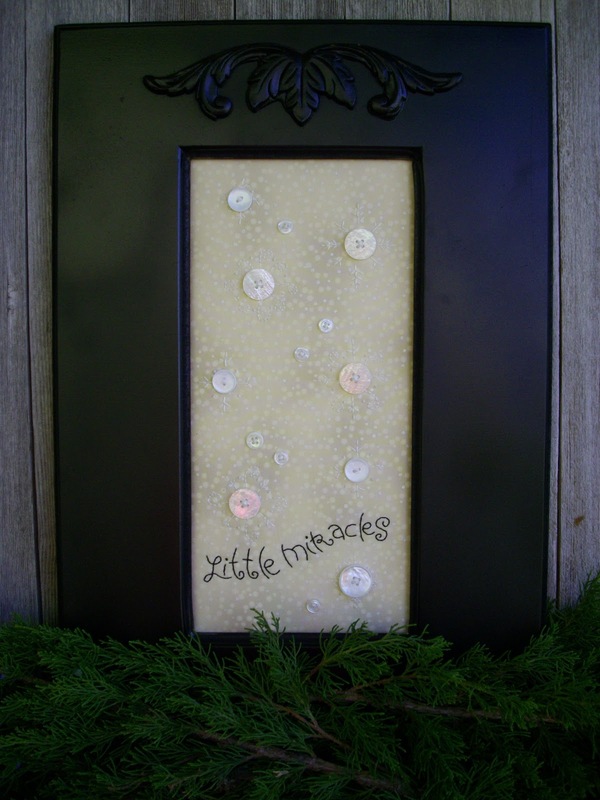 It is a simple pattern that uses your favorite white and cream buttons to create one of a kind "snowflakes" to celebrate the miracle that each flake is....perfectly created and one of a kind. Every family brought a couple dozen cookies for the cookie exchange and I made one of my daughters favorites Snowballs. So I thought I would post the recipe for all to share. Again...it's super easy and fun to do with little ones. ....and roll in powdered sugar. Place on parchment paper and bake at 350 degrees for 10 minutes. When they cool slightly dust with powdered sugar and enjoy! We had a wonderful family party...72 people together for food and fun in the snow. I thought I would post a few of the pictures, my favorite is the one of Dad with a few of his grandchildren sliding down the hill. It was priceless! I am very grateful for the little miracle that those snowflakes were for me this weekend...and I hope you enjoy a week full of my snowflake patterns! My husband landing off the jump! Grace, Becca and Addie making their hot cocoa....so cute! One of our favorite Christmas traditions is to build our own gingerbread house and men. This year with our move to the mountains we wanted to make a cabin in the trees. This week I am featuring my gingerbread stitch patterns 25% off and sharing our gingerbread recipe, so you and your little ones can have something fun to do on these cold evenings! It looks for complicated than it is. It is easy enough that our young children can help and I will give you a few tips we have learned over the years. Beat butter and brown sugar until fluffy in a large bowl. Beat in molasses and egg. Combine remaining ingredients in another large bowl. Stir dry ingredients into butter mixture. Wrap dough in plastic wrap, chill one hour. Roll out on a lightly floured surface to 1/8 inch thickness. Cut out pieces of house or gingerbread men and transfer to an ungreased baking sheet and bake at 350 degrees for 10 to 12 minutes. Lift off pan to cool. Makes 2 dozen men. To build a house you will need to double the recipe. We draw out two rectangles on paper and two ends using a strait edge we use a paring knife to cut the dough to create the house pieces. The roof we make out of cardboard. We have built large two story homes and learned through a few cave ins that if you use cardboard for the roof your house will set up very quickly. You'll see later how we cover it. To assemble pieces we take a large cardboard piece and use royal icing (it takes four batches) to frost the "ground" and put the house together. Put the sides together using a pastry bag to pipe the corners with icing. Hold in place for a few minutes until they set. You can also use a glass to hold it in place. Pipe the roof edges and put the roof pieces on. I cover the roof with frosted mini wheats because it give the roof a thatched snow covered look. You can glue them on with the royal icing. Pipe the edges to cover the exposed cardboard. Create ice sickles by pulling down some icing from the edges and twisting into points. Let this all dry for a few hours. While you are waiting you can frost the ground. We create a ice skating pond with a piece of mirror or tin foil covered with blue transparent film. Adam creates pine trees by taking sugar ice cream cones and frosting them with green royal icing and rolling or sprinkling them with snowflakes and cinnamon hots. Press them into the frosted snow and whala...you have a landscaped home. So go to http://www.tweetledeedesignco.etsy.com to order your gingerbread patterns at 25% off. They are super easy and fun. I had my 12 year old daughter stitch a set of these for her teacher along with a gift basket of gingerbread men. It's amazing what cold weather and time will inspire young kids to do. I hope this helps get you into the kitchen with your family to create something yummy and fun for the holidays. It's December 1st and officially the start of the "most wonderful time of the year"! All this month I will be posting a different Christmas pattern every few days for 25% off! 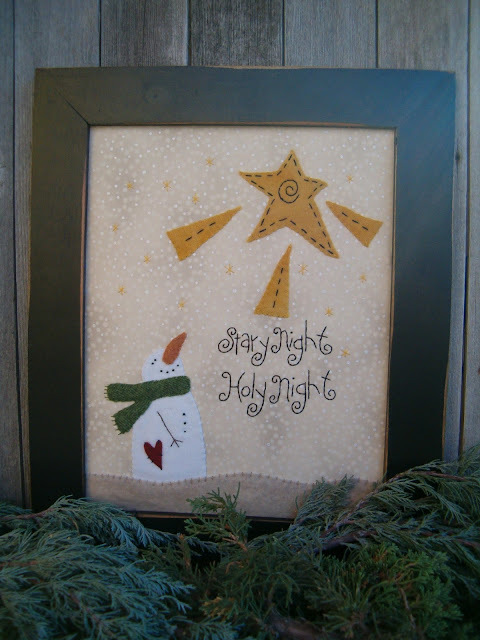 This weeks pattern is my super easy Merry Christmas Wool Applique. I am stitching a cotton sample tonight and will post pictures on Saturday. Super fun to play with and add different embellishments. So go to www.tweetledeedesignco.etsy.com to find the pattern for $6.00! I will be adding the frames in the next couple of days. Here's to a a month of celebrations! The Best Disney Princess Of All Time! We went this afternoon to see Tangled and all of us from young to old absolutely love it!!! The trailer does not even come close to how beautiful and sweet this story is. Your boys will love it (mine teared up) and your girls will want to be just like her. Beautiful touching story.....we are in love! Bravo Disney!!! Its the day after Thanksgiving and all the elves are up...full of pie and off to decorate the house. I hope you had a wonderful Thanksgiving with your loved ones and friends! So we all know I have to make snicker-doodles when it snows....which means I make them a lot! Friday night I found a fabulous blog called the The Cooking Photographer www.thecookingphotographer.com. I loved the photos and the recipes were making my mouth water, so Sunday I spent the day trying two of her creations. Lemon Snicker-doodles made with real cream, butter, fresh lemon zest and juice. Wow...they made my kitchen smell soooo fabulous....(and they tasted delish)! 1. Cream the butter, sugar, salt, and lemon zest and juice together. Beat in the whipping cream and egg. Beat in the baking powder and then mix in the flour until just combined. Refrigerate about 1 hour, or until cool, but not hard. 2. Preheat the oven to 375. Line two cookie sheets with parchment paper. 3. Mix together the cinnamon sugar ingredients in a small bowl. Scoop the dough with a mini or standard size cookie scoop and roll together with your hands into balls. Roll the balls in the sugar mixture. Place two inches apart on cookie sheets. 4. Bake cookies for 10 to 11 minutes for standard size cookies, and 7 to 8 minutes for minis. Cool for 3 minutes on cookie sheets and then move to a cooling rack. Can you smell the lemon? The second recipe that made me want to eat....was the Cranberry Chili Meatballs. Can I say oh my gosh?!? It is seriously the best meatball sandwich I have EVER eaten...and it was made in a Crockpot! 1. Add the cranberry sauce, chili sauce, a pinch of salt, some pepper, and a dash of red pepper flakes to a pot and bring to a simmer. Stir often and turn off heat when the two sauces combine. 2. Place the frozen meatballs, slice the peppers, and add sauce to a slow cooker and cook over high heat for 4 to 5 hours. 3. Slice good hoogie rolls and spoon in...sprinkle with Italian cheese. Seriously the best meatball sandwich in the world! So with the snow blowing and the kids making our first Woodland Hills snowman...cookies in the oven...meatballs simmering....it was a perfect Sunday. We are suppose to get 24" of frigged snow before Thanksgiving...brrrrrrrrrrr. I hope you have a wonderful Thanksgiving and try this recipe using your leftover cranberry sauce for one of the many football games your gang will be watching! Let it snow...let it snow...let it snow! This weekend we are suppose to get up to four feet of snow....so in anticipation of the white stuff...I am posting a simple SUPER easy project for you to make while you are "snowed in"! Place doily on cardboard backing and spray with white spray paint until white and wet. The spray paint stiffens the doily and helps the glitter stick. Once the doily has been sprayed (only one side) you can place in the center of the blue wool square. Take a paint brush and dip in fabric glue. Lightly touch tops and edges of the doily where you want extra amounts of the glitter to stick. Get a small amount of glitter on your brush and tab onto fabric glue spots and use fingers to lightly sprinkle all over the "snowflake". Let dry. Once dry....stretch wool on a piece of backing (cardboard) that will fit in the size opening on your frame and place in opening. Time to sit back and enjoy your one of a king snowflake that will glisten all season long! Cream butter, shortening, sugar and eggs until light and fluffy. Do not under beat. Add dry ingredients. Make into small balls and roll in 1 cup of sugar and 1 tsp. cinnamon. Bake at 400 degrees for 8 1/2 minutes. I place a cinnamon hot in the center of each cookie when they come out of the oven. The heat "melts" the hot into the cookie and such a fun burst of cinnamon in the center of my favorite cookie. I hope you are able to curl up this weekend in a warm blanket, and watch the beautiful simple miracle of the first "real" snow!